During the K’Nex event just this past thursday, I immediately thought of you guys and snagged a few Luigi K’Nex Samplers that were given away to everyone at the door. I didn’t actually get a lot, but there were 4 of us so we went out and in again for seconds a few hours later. So I have a total of four (4) Luigi Samplers to give out. You will also get the flyer that they had for the event – it’s not Ocarina of Time 3D quality, but hey, it’s free nonetheless. So while I was at the event, I actually started thinking about what contest I should do. For some reason that picture of Miyamoto checking out the Kinect last year got stuck in my head so I decided to do another caption contest. 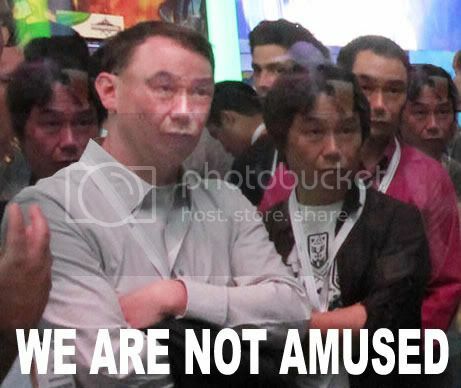 This image was taken at last years E3 during a Kinect demo (see the full image through that link). This image of Mr. Miyamoto was later discovered who happens to be there at the same time and at the right moment. The guy next to him on the left is Nintendo’s Bill Trinen who works for the company as a translator and interpreter. The image is priceless. Was he impress? Or did he think it’s horse manure? We may never know! I’m sure every video game exec at E3 gets to check their competitors and I’m sure a lot of them slips by unnoticed. How badly do you want this Luigi Sampler that could potentially net you thousands of dollars in 20 years? Write a funny caption for it then! Someone sold one on eBay for less than $6 bucks – so that’s $6 bucks worth to you at the moment! Again I have 4 samplers to give away and the winners will be announced next Friday, July 29, 2011. Open to the public.. Here ye, here ye.. They always have to copy us when we rake in the money. There’s nothing for you to waggle. Now I’m lost. I can’t believe you didn’t mention JC Rodrigo on the other side of Miyamoto! He’s a pretty awesome guy. i didnt know who that guy was! miyamoto: i think i just jizzed my pants! God this interpreter even copies my facial Expressions WTF! Funny Americans always behind on the power curve. Also curious.. any news on this?